Two-and-a-half hours over the course of a week is not much time at all, especially when it could curb the debilitating symptoms of Parkinson’s disease. And I’m not even talking about sitting in a doctor’s chair or visiting a treatment center; the time can be used at your leisure, doing whatever you like. Well, I guess there’s one catch: it needs to involve some form of activity. A new study published late last month shows that exercising for at least 150 minutes each week could significantly reduce the disease’s impact on mobility and quality and life. The research also highlighted notable results found in sufferers with both early and advanced stages of Parkinson’s disease, marked by the presence of tremors, stiffness, and trouble walking. And the good news is that the study doesn’t prescribe a particular type of activity to achieve these gains. Therefore, you can choose any form of exercise you like, whether it’s going for a walk, lifting weights, cycling, swimming, or dancing. If you suffer from Parkinson’s disease, particularly with advanced symptoms, it might be hard to imagine yourself getting up and being active. Losing absolute control over your limbs can not only reduce your mobility, but it can also take a big swing at your confidence, too. But the results of multiple studies looking at physical activity and neurological disorders have shown similar results—that exercise could improve neuroconnectivity and lessen the symptoms (or at least slow them) of such conditions. You should start out gradually with an exercise program if you want to improve your mobility and quality of life as shown by the results of this most recent study published online in the Journal of Parkinson’s Disease. The study revealed that starting with 30 minutes of exercise per week and adding 30 minutes each consecutive week (until you reach a minimum of 150 minutes) produced the best benefit for sufferers with advanced symptoms. For those of you still early in your fight against Parkinson’s who are perhaps more mobile, you can likely start out with a little more exercise per week. Because there is no cure for Parkinson’s disease, your best option to delay or minimize its symptoms is to change your lifestyle. 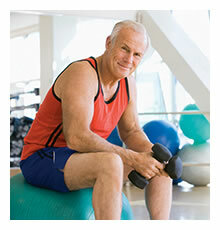 Staying active or starting an exercising program is highly recommended. Physical activity offers the best chance at upholding a decent quality of life and can help you manage the condition’s frustrating and debilitating symptoms. Preidt, R., “Exercising 2.5 Hours a Week May Slow Parkinson’s Progression,” Medline Plus, March 29, 2017; https://medlineplus.gov/news/fullstory_164357.html, last accessed April 4, 2017. Lin, T. W. et al., “Exercise benefits brain function: the monoamine connection,” Brain Sciences, March 2013; 3(1): 39–53. doi: 10.3390/brainsci3010039. Ahlskog, J. E., “Does vigorous exercise have a neuroprotective effect in Parkinson disease?” Neurology, July 19, 2011; 77(3): 288–294. doi: 10.1212/WNL.0b013e318225ab66. “Exercise,” National Parkinson’s Foundation, 2017; http://www.parkinson.org/understanding-parkinsons/treatment/Exercise, last accessed April 4, 2017.